The No. 16 Texas A&M Aggies embark on their 24th consecutive NCAA Championship as they host the North Texas Mean Green in a match Friday evening at Ellis Field. First kick is slated for 7 p.m.
COLLEGE STATION, Texas - The No. 16 Texas A&M Aggies embark on their 24th consecutive NCAA Championship as they host the North Texas Mean Green in a match Friday evening at Ellis Field. First kick is slated for 7 p.m.
Due to the kindness of the Aggie Soccer Club, students receive free admission to Friday evening's contest. Tickets may be purchased online at www.12thman.com/ncaasoccer or over the phone at 1-888-99-AGGIE during regular business hours. The Aggies earned an at-large bid and a No. 3 seed with their 15-4-1 overall mark and No. 10 RPI. The Maroon & White finished third in the SEC with a 6-3-1 league ledger and exited the SEC Tournament in the quarterfinal round. Texas A&M owns a 12-game NCAA unbeaten streak at Ellis Field, with the last postseason home loss coming in 2007. Last season, they bested Lamar in the opening round, 1-0, and then played Notre Dame to a 2-2 draw before having their season ended in penalty kicks. The Mean Green enter play with a 15-2-3 overall record, winning the Conference USA automatic bid with a 2-1 double overtime victory against Southern Miss. North Texas finished tied with Florida Atlantic atop the Conference USA league table with an 8-1-1 mark. Aaliyah Nolan leads the Mean Green in scoring with 24 points on 10 goals and four assists. Kelsey Brann has played 1,763 minutes in goal for North Texas, logging a 0.56 goals-against average and nine shutouts. The Aggies are 4-0-0 all-time against North Texas with all four prior meetings coming in College Station. 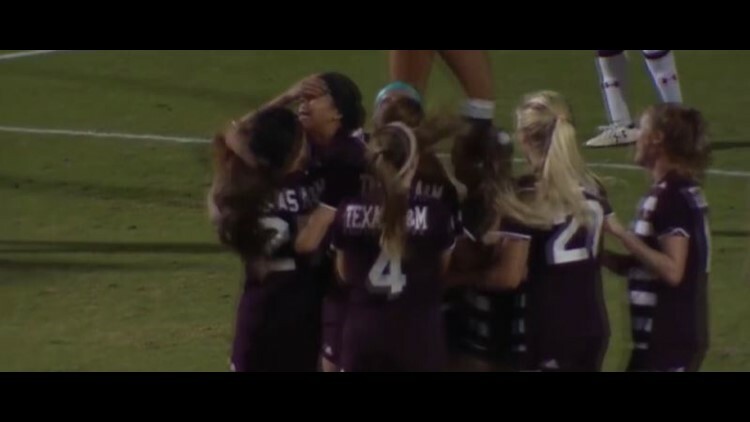 The teams last faced in 2015 with Texas A&M winning, 2-1, on Karlie Mueller's golden goal in the 109th minute. The initial meeting came in 1998 with the Maroon & White prevailing, 5-1. In 2000, the Aggies triumphed in overtime, 4-3. Texas A&M's largest margin of victory came in 2004 with an 8-2 win. Texas A&M has advanced to the second round of the NCAA Championship in each of the last 20 seasons. It marks the third-longest active streak behind only North Carolina (36) and Virginia (24). The Maroon & White have gone 18-0-2 during the span, advancing on penalty kicks in 2003 (vs. SMU) and 2010 (vs. North Dakota State). The Aggies are one of four teams to play in each tournament since 1995. The other schools to make it to every tournament since 1995 are North Carolina (1982-2018), Virginia (1994-2018) and Penn State (1995-2018). A&M is 35-21-7 (.603) all-time in the NCAA Championship. Aggie head coach G Guerrieri and North Carolina's Anson Dorrance are the only two coaches to appear in every NCAA Championship since 1995. The winner of the match faces the winner of the BYU-TCU match in a second round contest. If Texas A&M and Tennessee both win, the contest will be played in Knoxville. If Texas A&M wins, but Tennessee loses to Louisville, the contest will be played at Ellis Field. If BYU wins, the match will be played on Thursday. If TCU wins, the match will be played on Friday.